Home &sol; Archive by category "Commercial solar HW"
A recent blog post discussed light commercial systems for restaurants and other similar businesses. But what if you need a solar thermal system with a bit more uumph? Here’s the recipe for a solar hot water system that would be perfect for, say, apartment buildings or hotels. It provides 330 gallons of hot water per hour, with significant backup strength. The example I’ll discuss below is for a two-building apartment complex in Los Angeles, in which the solar thermal is targeted to provide 50 percent of hot water demand. This size of solar thermal system — six solar collectors backed up by a Solar Phoenix modulating water heater — also works great for large restaurants or smaller hotels. 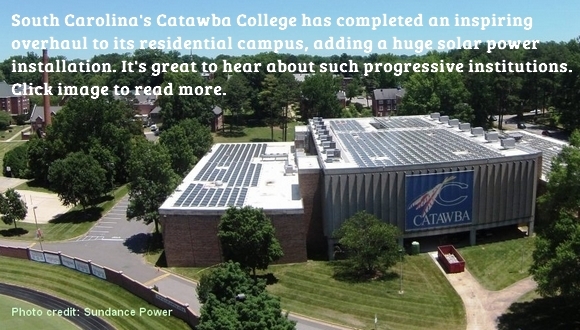 To illustrate this, take a look at this case study of a solar thermal system on Catawba College in Salisbury, NC (click here for the case study). Cost analysis indicates that energy costs at the school were cut by 58 percent. Now that’s a success story. Building A has a hot water demand of about 500 gpd. It’s made up of 16 two- and three-bedroom units; a laundry room with four washers; a community kitchen; and a staff restroom. Building B has a hot water demand of 800 gpd. It includes 25 one-bedroom units; three washing machines; and one mop sink. The solar thermal system I designed for this apartment complex features a 199-BTU Solar Phoenix, a highly efficient water heater that stores nearly 120 gallons of solar-heated water and kicks in as backup with more water in needed than can be heated by the sun. It’s a drainback system to guard against overheating. Also, I’ve upped the solar water storage with the addition of a second 119-gallon tank. While a light commercial system may require three to four solar collectors, for this application, I’ve recommended six 4’x’8’ collectors. 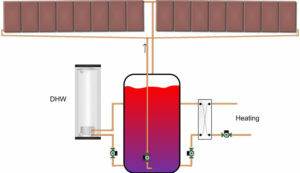 The control strategy uses a tank-to-tank transfer pump that will transfer the solar heat to the water heater, but will not allow the water heater to heat the storage tank. This is not a solar tank preheating a water heater; rather this is solar heating 240 gallons of storage and the water heater only firing to make up what the solar will not produce. Data logging that allows solar production to be posted on the internet is available if the apartment building supervisors have an interest in seeing how well the solar system is performing. In colder climates, I would recommend increasing the number of collectors to eight collectors or upgrading the size of the collectors to 4’x10’ panels. For more systems featuring the Solar Phoenix, see the Solar Library on this site. Here’s a new concept for commercial solar: a 250,000-Btu tankless water heater. It comes down to this simple philosophy: Don’t pay to heat ’til you need it. As you study this concept illustration, you’ll realize how simple this is. And, when you compare this setup to a conventional design, the cost will be half. back-up. The Hydra Smart water allows for a gas or electric backup. In locations that have 300+ days of sunshine (all the southern U.S., for instance), I’d recommend this tankless with an electric backup. You can actually get real close to having 100% of the domestic water heating covered all by solar. With the addition of the new Cocoon Tanks — large, super-insulated and designed to fit through any door — you can store several days of hot water. The simple drainback design lends perfect protection from freezing and overheating. Most importantly, the backup heater will rarely get used. If you’re looking for a small domestic hot water system for your home or a client’s commercial job (laundromat, car wash or restaurant, for example) these new products and designs will dramatically cut the cost in half and make solar the big hit it should be. Out with the old (over complicated, expensive solar). In with the new (better and more efficient solar at lower cost). Case in point: the Minneapolis- St. Paul international Airport’s cutting-edge solar thermal system with a new innovative design approach. Two decades ago, conventional solar called for installing a water heater or, for larger systems, a boiler that heated a tank. Later, solar morphed into separate, individual components that drew heated water into the water heater storage only if someone washed their hands. This design suffers from too much heat loss, and the solar can’t heat the water heaters to prevent them from firing. Preheating is now an outdated and inefficient design. The new design we’re sharing today integrates the drainback tank and storage tank, reducing costs and components. At the Minneapolis-St.Paul airport, the engineering firm of Michaud, Cooley & Erickson did this with great finesse and accuracy. All 152 collectors charge the storage tank. Because the storage tank is a huge drainback tank, no energy is left to waste in a separate individual drainback vessel. That cost is eliminated too. 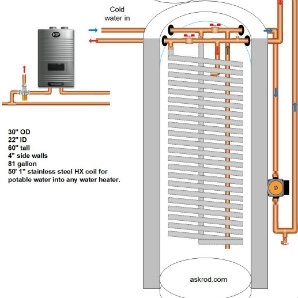 Conventional designs use a heat exchanger to transfer the solar BTUs into the storage devise. Any time you launder BTUs through a heat exchanger, you’ll pay an efficiency penalty. Store the pure energy until it is needed, and then use a heat exchanger to deliver it to the needed source.